Ogham in 3D is a mapping project making 3D models of as many of the 400 surviving Ogham stones as possible. These models will then be freely available on the Dublin Institute for Advanced Studies website as part of a multi-disciplinary archive of Ogham stones. 3D mapping is a technology that creates three-dimensional views of objects on computer screens. This type of technology is often used in modern computer programs to provide a life-like view of a place or thing on a map, a virtual copy. Creating a digital copy of a subject allows for limitless possibilities. It is an accurate copy of the subject which can be shared with anyone you wish to. This might be as a simple 3D model or as a web based portal. The digital data has the potential to give an audience access to the subject which without the scans might not otherwise have been possible. This data can be 3D printed as a replica to any scale or it can printed for distribution as a hologram for exhibitions and demonstrations. The data can be examined in detail with sophisticated visualisation techniques, new discoveries about the subject are often made simply by examining the scan data. They have already 3D mapped half of the Ogham Stones on the Dingle Peninsula. See example here. According to Isabel, 3D mapping of the Ogham stones, will not only help in their digital preservation, a simple archaeological visualization, it can become an analytical tool. Through the digital maps, they might be able to read inscriptions, previously undecipherable to the naked eye. Nora White, the project manager, is a expert in Old Irish, and this work could help in collating archaeological data and research previously collected from the area. 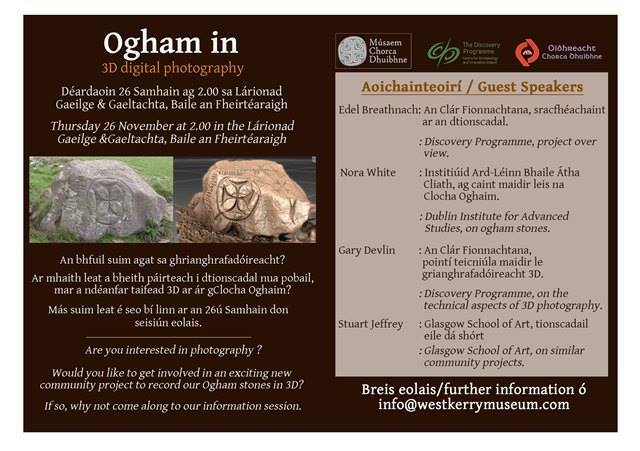 The Ogham in 3D project, is now reaching out to residents of the Dingle Peninsula, and indeed anyone with an interest in archaeology, history or photography to join this project. By transforming it into a community project, there is more scope to get all the stones mapped, and to create an interest in, not only the heritage of Corca Dhuibhne, but also new technology for the preservation and study of our heritage. Its a very exciting project, and one I will gladly throw myself into, so I can see the real benefits of using digital technology for cultural heritage. I can get my hands physically and digitally dirty, as I roam the Dingle Pensinula in search of stones to map! Has Digital Technology made us less curious?